Located between Naples and Fort Myers, Bonita Springs is one of the fastest growing coastal communities in Southwest Florida. 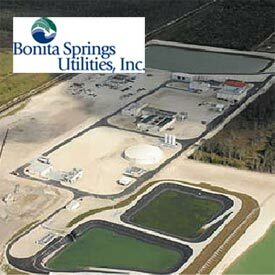 The challenge of serving the potable water, irrigation water, and wastewater treatment needs of this flourishing community is fulfilled by the award-winning, not-for-profit water and wastewater utility, Bonita Springs Utilities, Inc.
BSU’s territory incorporates a 60-square mile area, and the number of customers served in 2000 doubled to more than 35,000 homes and businesses by 2006. To accommodate the continued rapid growth in market size and demand, BSU has been growing with its market since 1971, increasing both potable water-producing capacity and wastewater treatment capacity with the latest, most efficient technologies. Evidence of BSU’s expertise shows in its honors received, including Florida Department of Environmental Protection’s 1999 Wastewater Treatment Plant Award for the South Florida District; Florida Water and Pollution Control Operators Association’s Outstanding Safety program; Southeast Desalting Association’s Plant of the Year for 2005/2006; and 2007’s “Best Tasting Water in Southwest Florida”, as judged by the Florida Section of the American Water Works Association. The most recent addition to BSU’s state-of-the-art infrastructure is the East Water Reclamation Facility brought online in the spring of 2007. Located on a 165-acre site and currently designed to handle as much as 4 million gallons of domestic wastewater a day, the $58 million facility is the most technologically advanced plant in Florida. It uses membrane-bioreactor technology to reclaim wastewater and produce effluent for irrigation, reducing demands on the area’s precious aquifers. The new facility is also linked to BSU’s existing wastewater plant, providing an effective backup system. To accommodate future growth, the East Water Reclamation Facility’s daily production capacity can be expanded to 8 million gallons, and the site itself can accommodate long term expansion to 16 mgd. Southwest Florida is particularly susceptible to the impacts of both Atlantic and Gulf tropical storms and hurricanes. Landfall by one of these strong weather systems can leave essential public infrastructure without electric power for protracted periods of time. The East Water Reclamation Plant is the latest addition to the Bonita Springs Utility’s critical infrastructure, and while the new automatic emergency power system would provide power for selected loads during short-term power interruptions, a quite different supplementary capability had been envisioned for plant operations during major weather events. To prepare the facility and the emergency power systems for an incoming storm, plant operators would require not only a robust, reliable and carefully configured system of controls but also a small window of time to bring the emergency system on line and manually isolate the plant from the utility grid until danger passed. Fortunately the paths of severe storm systems are carefully tracked giving emergency management officials and plant operators the time needed to put their plans into action. A unique emergency control system would be necessary to execute this critical task. 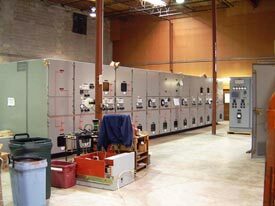 Industrial Power Systems has a reputation, established over many years, for developing outstanding generator controls for water and wastewater facilities. Working with Cogburn Brothers Electric (project electrical contractors), CH2M Hill (project engineers), and Ring Power Systems (Jacksonville, Florida-based Caterpillar power generation distributor) IPS developed the specifications for this facility’s unique generator controls. All emergency electrical power requirements are met by a 1750 kW Caterpillar generator set supplied by Ring Power Systems. The control and operating bridge between the generator and emergency plant operations is the IPS-designed and manufactured switchgear—a 4160 Volt, 3 phase, 3 wire, 60 Hz. Closed Transition Paralleling and Distribution Switchgear including medium voltage (5KV) circuit breakers and main bus rated at 1200 Amps. In anticipation of a Phase II plant expansion, the switchgear is designed and installed to operate two 1750 kW generator sets. The special IPS design allows for trouble-free generator set expansion when the additional capacity is required by the utility. Typically, emergency power systems are designed to start automatically when a power failure occurs. This feature would still be required for the Bonita Springs project, but suppose BSU operators had the capability to intervene and manage the emergency before an expected power failure was to occur? Before a hurricane landfall, for example, operators could smoothly transfer all critical operations from the grid to emergency generators and avoid a blackout. To perform this challenging task, IPS designed and built a system of controls and switchgear that allows plant operators to start the emergency generator manually under ‘no power failure’ conditions, to connect the generator to the utility while the plant is under utility power (a closed transition transfer), and to transfer dedicated loads to the generator before disconnecting from the utility. This is a seamless operation with no loss of power during the transfer. Operators can keep the emergency system running and isolated from the grid until the danger passes. Then operators can reset the system to seek the availability of utility power and automatically transfer plant loads back to the utility prior to emergency system shut down. Normal emergency standby conditions for ‘power failure’ (an open transition transfer) are then reestablished within the control system. A secondary yet very important benefit in this closed transition system is the ability to schedule and exercise the emergency generators under load—a very important requirement to ensure the availability and reliability of emergency power engines when they are needed most. The nerve center of the integrated IPS switchgear is composed of redundant PLC controls (programmable logic controllers), a Human Machine Interface (HMI), and adapted SCADA automation software. Two PLC systems constantly monitor utility power quality and control all generator functions whenever emergency power is needed. Each receives identical data simultaneously and acts as “live” back up to the other (redundant). 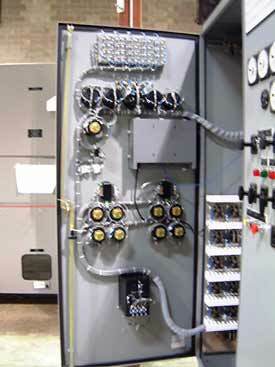 Should one PLC fail, the second automatically takes over to prevent a potential outage or loss of the emergency system. The HMI provides a touch screen, multi-graphic display and interface to monitor and operate the entire system based on data being received from the PLCs, generator set alarms and fault conditions, engine operating parameters, electronic engine/generator set controllers, protective relays, breaker trips, and digital power metering. Integration of control logic operations between the PLCs, HMI, and emergency generator system is provided by SCADA automation software adapted for the application using the latest versions of Allen-Bradley Rockwell’s ControlLogix and PanelView hardware, and RSView software. A feature of IPS’s outstanding commitment to quality products and service is that all parties – Cogburn Brothers Electric, CH2M Hill, Ring Power Systems, and Bonita Springs Utility personnel – were invited to IPS for factory acceptance testing prior to shipment of the switchgear to the jobsite. This took place over a 2-day period while the equipment was tested through all designed sequences of operation to the satisfaction of the Consulting Engineer and Bonita Springs personnel. Also confirmed at that time were installation procedures, field interconnection wiring details, and IPS field service personnel arrangements. Following the installation, IPS and Ring Power Systems field personnel performed system start up to commission the switchgear, SCADA automation software system, and remote monitoring systems. Representatives from the SCADA integrator participated and Cogburn Brothers Electric, CH2M Hill, and Bonita Springs Utility operators attended the successful handover process.